132 House Republicans Did Not Sign This Letter Supporting the End of Net Neutrality—But Who Did? Of the 239 Republicans in the US House of Representatives, only 107 added their names to a letter released this morning supporting FCC Chairman Ajit Pai’s plan to repeal net neutrality rules. The thing is, many of the signatures are totally illegible. About 20 representatives included their state and congressional district next to their names, but that seems to have fallen out of practice by the top of the second page. And while many of these John Hancocks are readable, some of them look like they were written by someone with a pen in their mouth. The letter, which calls Pai’s plan a “major step forward in the effort to clear the way for the substantial investment necessary to advance our Internet architecture for the next generation,” was co-authored by House Energy Committee Chairman Greg Walden and Technology and Communications subcommittee chair Rep. Marsha Blackburn. Reached on her cellphone, a spokesperson for Blackburn said she would forward Gizmodo a list of the names. But several hours went by and we just assume that wasn’t happening. 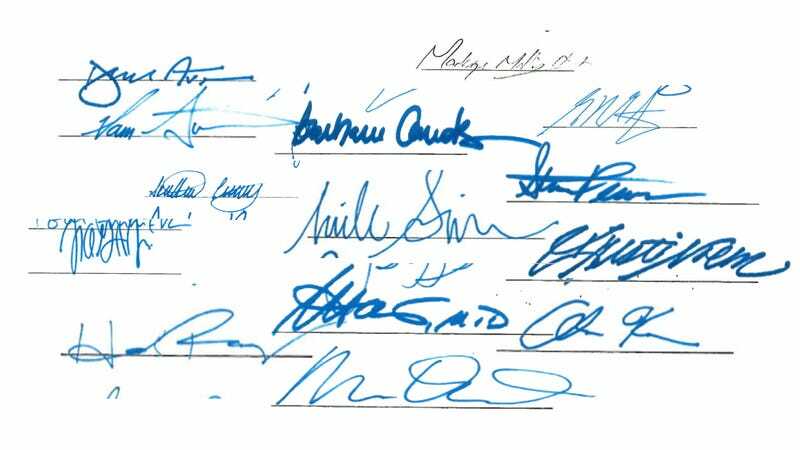 Here’s a list of the lawmakers we know for sure signed the letter. (We excluded a few we’re only 99 percent certain about.) Further down, we’ve collected a sample of some of the worst scribbles Congress’ lower chamber has to offer. If you recognize your representative’s signature, let us know who they are—and what you think about their support for Pai’s plan. Ultron M.D. and Mr. Old. Steam Prism and ... okay, I’m pretty sure that’s actually South Dakota Rep. Kristi Noem. This is likely just the name of someone’s favorite black metal band. The FCC vote to repeal the net neutrality rules will take place tomorrow after 10:30am ET when the commission convenes for an open meeting. Without a significant objection from Republican lawmakers, the order will likely pass. We expect a slew of lawsuits to follow and a legal battle that will stretch on well past the 2018 midterms. If you live in a Republican district and don’t see your representative’s name here (or can’t decipher it from one of the signatures above) you should probably call them and ask where they stand on the issue—that is, if net neutrality is the sort of thing that’s likely to sway your vote. Updates: According to @rin97 on Twitter, the third signature from the bottom is Dave Trott (MI-11). I don’t know why I thought that was a “J”.